Underneath you can see the early Ford Rear Axle & Center Housing, brake master cylinder, brake backing plates, friction shocks, and I-Beam Front Axle that we all sourced from Norman's R&MCo product line. You can also see the R&D unique oil filter. 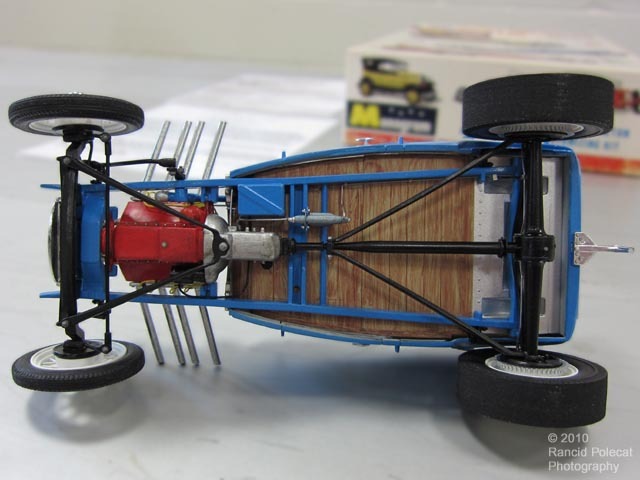 The steering is poseable and incorporates parts from a Monogram "Blue Beetle" and Revell 1929 Ford Model A Pickup kit.